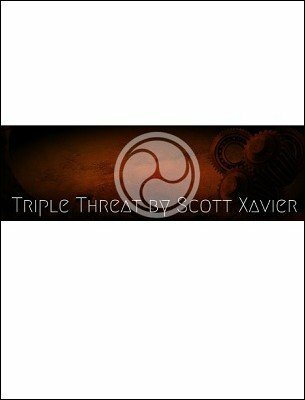 Triple Threat is a collection of mentalism and magic effects that Scott Xavier has been working on for nearly ten years. In this manuscript you will find a no gimmick coin in hand routine. This is as pure as it gets. When you leave behind the dirty work, you'll even be able to develop your actual ability to predict a game of guess which hand a coin is in. And.... You're always right! Plus, because in the other effects, there's no finale, now there's a kicker ending too. You'll also get Scott's unique card stab using a crossbow. This is the actual effect that he uses to close his 4 diamond resort show every night. It's gotten Scott Xavier and the resort more 5 star trip advisor reviews than any other performer there! You'll also learn a way to borrow a coin and hypnotize a spectator to not be able to lift that coin from your hand. Then the spectator will get super human strength and squash, bend, and melt that borrowed coin into liquid molten metal in the audience members hand! This isn't your average mentalism, this is the triple threat of mentalism.